President Donald Trump speaks to reporters at the White House, Friday, June 15, 2018, in Washington. President Donald Trump opined on a wide array of subjects Friday, claiming former FBI Director James Comey took part in criminal activities, admiring the way North Koreans pay attention to their dictator and inaccurately blaming Democrats for his administration's new policy of separating immigrant children from their parents at the border. The remarks came in a remarkable, impromptu interview with Fox News Friday morning followed by a frenzied press scrum outside the White House. Trump's back-and-forth also ranged from the Russia and Hillary Clinton email investigations to his relationships with foreign leaders, with comments that at times were inaccurate or highly misleading. Trump said the Justice Department watchdog report on the Clinton email probe released Thursday shows the FBI was biased against him "at the top level" and was "plotting against my election." Asked if James Comey, the FBI director he fired, should go to jail, Trump said, "what he did was criminal" though he wouldn't want to get involved in Justice Department matters. While the report faulted Comey as "insubordinate" and said politically biased text messages by a handful of FBI employees gave the "appearance" of impropriety, the report found that the big decisions in the Clinton case weren't motivated by political bias. 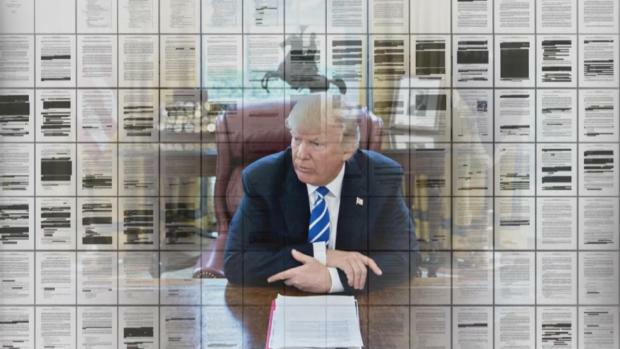 Trump also claimed the report discredited special counsel Robert Mueller's investigation into collusion as well. FBI agent Peter Strzok did work in both the Clinton and Russia investigations, but was removed from Mueller's probe in the summer of 2017. Mueller has been discussing with Trump's lawyers the possibility of Trump testifying. Trump suggested people who have pleaded guilty to lying in the probe are being caught for minor misstatements. "I would like to talk but it seems to be very biased," he said. Trump said Michael Cohen, whom a source to The Associated Press has told is in need of new legal representation in an FBI investigation of his business dealings, is no longer his lawyer. Trump didn't answer if he thought Cohen would cooperate with prosecutors and said he hasn't talked to him in a long time. Trump dismissed questions about whether he dictated a statement his son Donald Trump Jr. gave to The New York Times about a meeting at Trump Tower that's said to be under investigation by Mueller. A lawyer for Trump had denied he did so, only for his representation to change their story in a letter revealed last week. Trump simply said the statement was given to "the phony New York Times" and not something said in court. 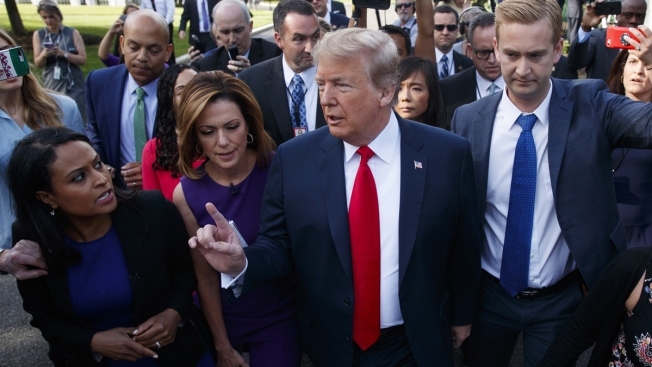 Trump marched out of the White House for the unplanned half-hour interview on "Fox and Friends" and the subsequent question-and-answer session with reporters. Trump hadn't previously made an impromptu visit to the White House's North Lawn, where TV journalists set up for reports. He told one reporter to be quiet and called her "obnoxious." Trump made several false statements, including that Paul Manafort, who served as his campaign chairman for nearly half a year, "has nothing to do with our campaign." He claimed the inspector general report "went a long way to show" there his campaign involved no collusion or obstruction, even though the report didn't make any judgments on facts in the Russia probe, and that President Barack Obama "lost Crimea," when Russia annexed that part of Ukraine in the face of global opposition, including from the Obama administration. The president also said he hates that immigrant children are being taken away from their parents when they are detained at the border but incorrectly blamed Democrats, something he's done in the past. In fact, the forced separations have been the result of his administration's new "zero tolerance" policy. Asked about the policy in a subsequent gathering of reporters, Trump claimed the zero-tolerance policy is Attorney General Jeff Sessions "following laws, very simply, that were given to us and forced upon us by the Democrats." He said negotiations with Democrats are ongoing. House Republicans have been considering two pieces of immigration legislation, but Trump told reporters that he won't sign a "moderate" bill that was negotiated between the party's moderate and conservative wings. That statement ignited confusion, and Rep. Patrick McHenry, the House GOP's second-ranking vote counter, soon said the party was "seeking clarity" from the White House and won't "take on immigration without the support and endorsement of President Trump." Trump was also asked about press secretary Sarah Huckabee Sanders' contentious briefing with reporters on Thursday over family separations at the border. He said he thought Sanders is "a very nice person" and is treated unfairly by the press. He dismissed a CBS report that Sanders was planning on leaving soon, saying that she "loves this job." (Sanders also said the report was premature). But Trump said that at "at some point" everyone leaves. Trump raised eyebrows when he said on Fox News he wants people to pay attention to him the same way they do to Kim, the brutal leader of North Korea whom Trump met with this week in Singapore: "He speaks and people sit up at attention. I want my people to do the same." Asked about that comment later, Trump said he was "kidding" and told reporters, "you don’t understand sarcasm,” waving off the comments. The Senate Minority leader, Chuck Schumer, D-NY, took issue with the comment in a tweet: "This is the United States is America, not the United States of Trump. We are a democracy not a dictatorship. So thank God this will never happen." Trump also said North Korea has already started returning the remains of U.S. troops killed in the Korean War, which Kim agreed to in the summit on Tuesday. The Trump administration has yet to offer details on remains being returned. While Trump insisted that Kim agreed at the summit to denuclearize, the document they signed only goes as far as saying Kim will work toward denuclearization and provides no specifics on how independent inspectors will verify that they have deactivated their nuclear weapons. "We're going to have a very strong verification process," Trump said. Trump came out to speak to reporters just after announcing $50 billion in tariffs on Chinese products, which he said was necessary to protect "the great brain power in Silicon Valley," whose secrets are being stolen by China and others. He also had strong words for the U.S. allies, like Canada, he's been insisting have taken advantage of the U.S. on trade. Yet he said he still has a great relationship with their leaders, saying they all called him to wish him a happy 72nd birthday on Thursday. "I took it very well," Trump said.